According to the firm’s research, iTunes download rates for music and iOS apps are both still growing, but accelerating much faster for the latter. 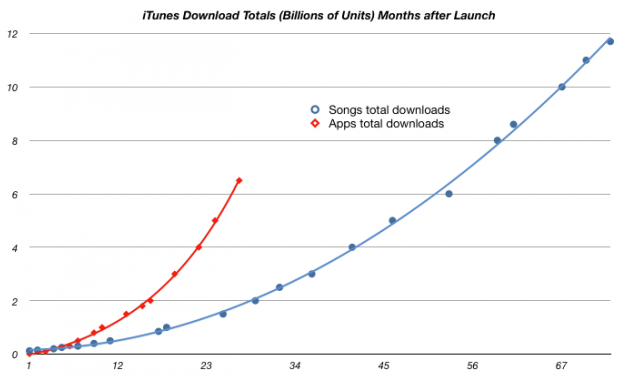 In fact, Asymco posits, based on data from the recently updated Music and App Store, that the total number of app downloads has already reached the same level as that of songs in less than half the time. Assuming Asymco’s numbers are correct, it took roughly 2.2 years for the App Store to serve up 6.3 billion apps, while it took approximately five years for the iTunes Music Store to reach that same number. 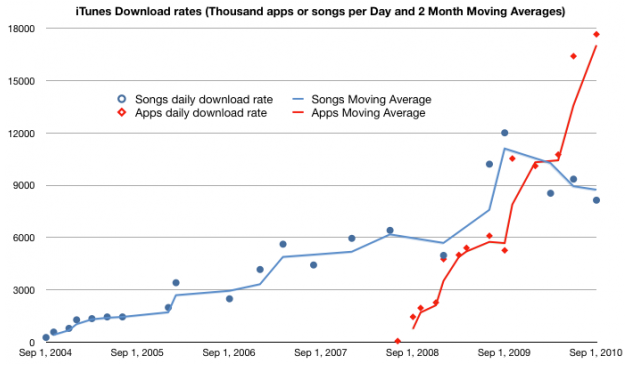 If current trends persist for both, Asymco considers it likely that app downloads will overtake song downloads by year’s end. Cumulative unit rates aside, Asymco last weekend posted another graph, depicting how music downloads continue to slow, particularly compared to apps. Asymco says iOS users are currently downloading 17.6 million apps compared to roughly 7.5 million songs per day, on average.